San Quentin Prison Guard Lookout Tower-San Quentin State Prison is a California Department of Corrections and Rehabilitation state prison for men in San Quentin, unincorporated Marin County, California, United States. Opened in July 1852, it is the oldest prison in the state. California's only death row for male inmates, the largest in the United States, is located at the prison. It has a gas chamber, but since 1996, executions at the prison have been carried out by lethal injection. 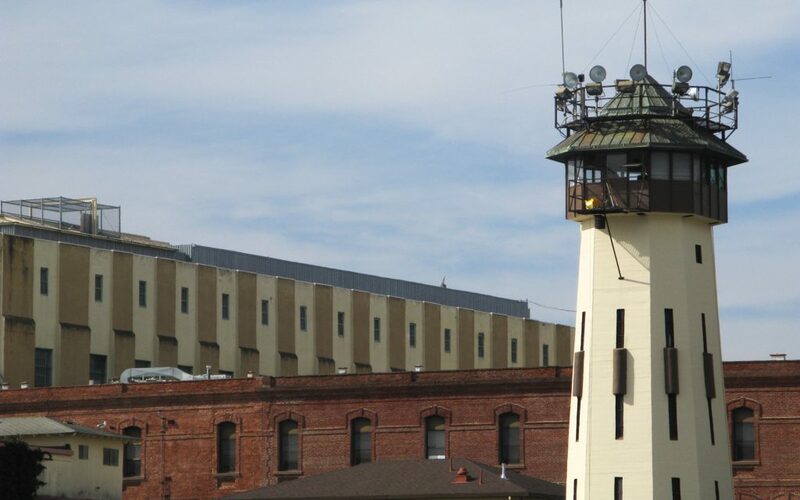 The prison has been featured on film, video, and television; is the subject of many books; has hosted concerts; and has housed many notorious inmates. Walk down the streets of most big California cities and it’s easy to forget that cannabis is still an illicit drug. Between the state’s massive medical marijuana market and generally relaxed attitudes on consumption, it sometimes feels as though cannabis in California already legal. But it’s not. And a new study proves it. Thousands of people in the state are jailed on cannabis charges—and only cannabis charges—each year. 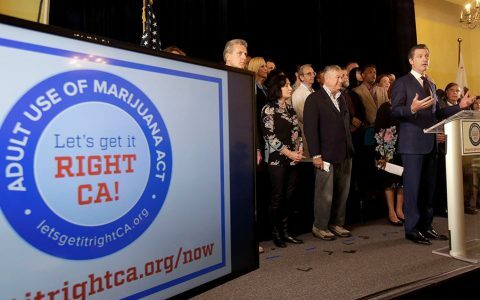 In 2015, an estimated 2,139 people in California were convicted, sentenced, and jailed for offenses that involved only cannabis, according to a study commissioned by Drug Policy Action, the political action arm of the Drug Policy Alliance. 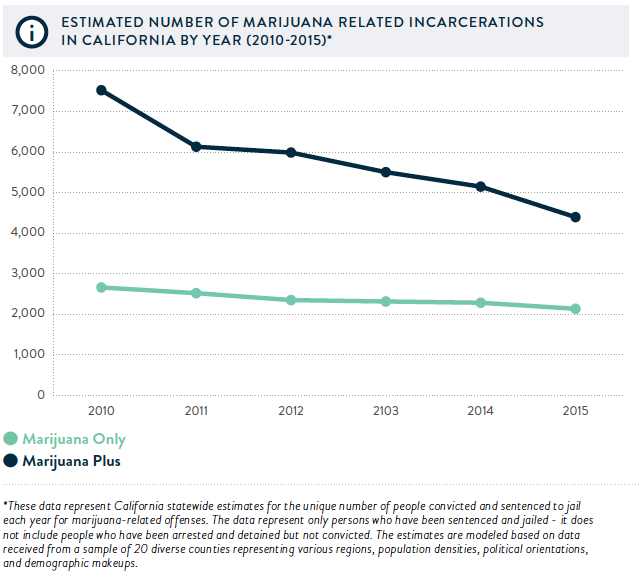 That’s a decline of 21 percent from the 2,665 people jailed for cannabis-only offenses in 2010, the year before a statewide decriminalization measure took effect. 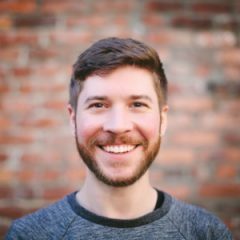 The fact that so many people are still in jail for cannabis alone is exactly why full-scale, adult-use legalization is so important, said the group, which has endorsed Prop. 64, a measure on the Nov. 8 ballot that would legalize adult-use cannabis. 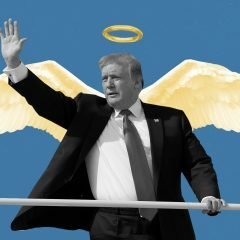 It’s a sentiment echoed by John Kagia, an executive vice president at Washington DC-based Frontier Finance Group, which conducted the study. The study surveyed counties across the state. Those that responded, including Los Angeles, Orange, Santa Clara, and Contra Costa counties, represent 47 percent of the state’s population. Together they had 1,064 people in jail for cannabis offenses in 2014. Statewide, the average sentence for cannabis-only offenses is approximately 5 ½ months, the report found. But that’s not consistent from place to place. In affluent Orange County, for example, the mean sentence was 32 days. In Los Angeles County the average sentence was nearly 8.5 times longer—269 days. 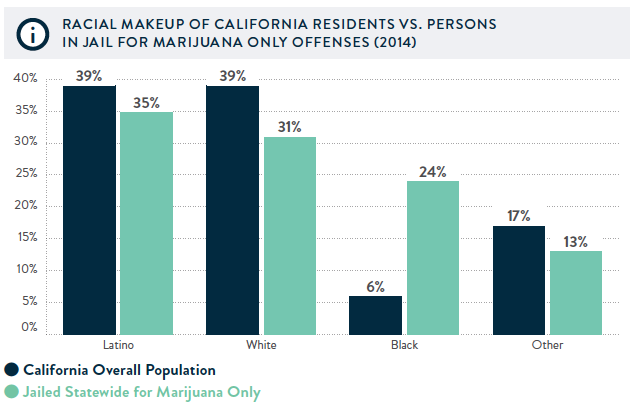 The study also identified what it called “stark racial disparities in California’s marijuana-related jail population.” Among them, nearly a quarter of all people jailed for cannabis offenses are black—despite black Californians making up just 6 percent of the state population. Black, white, and Latino individuals use and sell cannabis at similar rates, the study says. 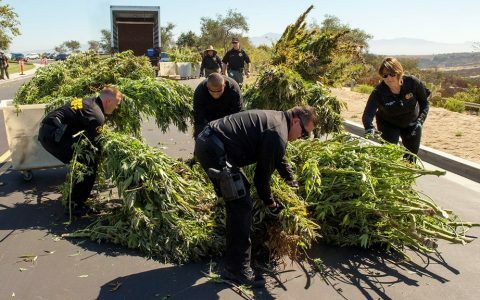 Each reform measure California has passed, starting with its first-in-the-country medical cannabis law, has eased the burden on the state’s criminal justice system. Medical marijuana, allowed under a 1996 measure, protected patients who had once turned to the black market to obtain medicine. Statewide decriminalization, which took effect in 2011, led to a further drop in arrests—along with falling overdose and school dropout rates. Prop. 64, proponents say, would close the loop by bringing the industry into a legal, regulated space. The measure would reduce or eliminate penalties for most cannabis-related charges, and minors convicted for cannabis offenses would be given free drug education instead of being locked up. 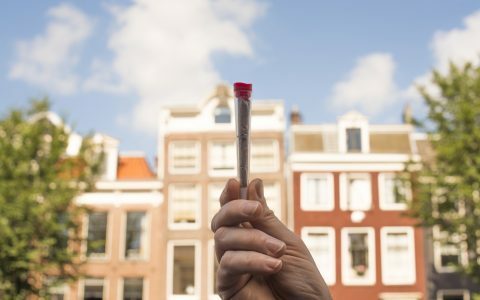 Opponents counter that some penalties, such as that for giving cannabis to a minor, would actually increase. The vast majority, however, would not. People who are already incarcerated could petition the court under Prop. 64 to shorten or end their sentences, and those already out of jail could have their records expunged. Politics 13 Things You Might Not Know About California’s Prop. 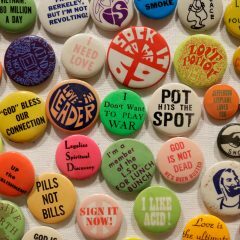 64 Politics Think Cannabis is ‘Essentially Legal’ in California? 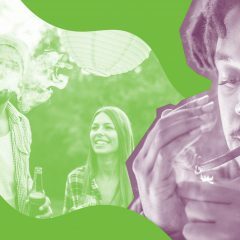 Lifestyle Which 15 Celebrities Support Legal Cannabis in California? Politics If You’re Pro-Cannabis, Why Would You Not Vote for Prop. 64? Luckily California voters have made this a non-issue by going fully recreational. Look for law enforcement resources to be better used moving forward. As for the racial disparity of arrests in the past, can we move on from that too? Yes, minorities have been arrested at a higher rate than whites, but there are too many other factors that make it an uneven playing field. Where do police patrol the most? In crime-ridden ghettos, of course. They’d be wasting their time patrolling areas where crime is low. So when the police saturate a given neighborhood, it only figures they will write more speeding tickets and arrest more drug users in that district. Plus, it’s more of a challenge to find a place to spark up in a crowded inner city as opposed to a spread-out suburb. There’s less of a need to smoke weed in a car when you’re in the burbs, hence less arrests. Just my theory, I may be wrong. I’m sure there is still some level of selective law enforcement…..just not as glaring as the numbers would indicate.